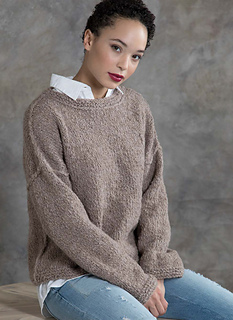 A simple crewneck pullover with a roomy fit takes its cues from an unusual yarn: a bulky wool-alpaca boucle. This sweater is completely reversible; wear it right-side out with the purl side facing or inside out with the knit side facing and visible seams. Either way, it’s quick and effortlessly chic. Finished Size: 32 (35.5, 40.5, 45.5, 51.5)“ bust circumference. Pullover shown measures 40.5”. Yarn: Tahki Yarns Arctic (70% organic merino wool, 30% alpaca): #02 bark, 7 (8, 9, 10, 11) balls. Needles: Size 10 (6 mm) straight and 16” circular. Adjust needle size if necessary to obtain the correct gauge. Notions: Marker; stitch holders; removable needle; tapestry needle. Gauge: 13 sts and 18 rows = 4” in rev St st.